Preheat oven to 450 degrees . 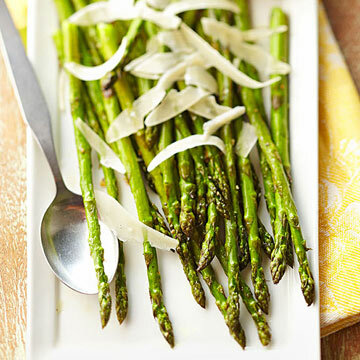 In a shallow roasting pan, toss trimmed asparagus with oil, garlic, salt and pepper. Roast, uncovered, for 5 to 7 minutes or until asparagus is crisp-tender. Transfer to a platter; sprinkle with lemon juice and cheese.